Usually when I ask adults, “What are you going to be for Halloween?” they laugh, and really I am just joking. But when I posed that question to a co-worker yesterday, he said, “A cereal killer.” He told me with some enthusiasm that he was going to paste the front panel of a cereal box on a red-splattered T-shirt. I had to laugh. “Well, good for you, Nick!” I forgot to ask what killer cereal he was going to use. Probably one loaded with sugar. 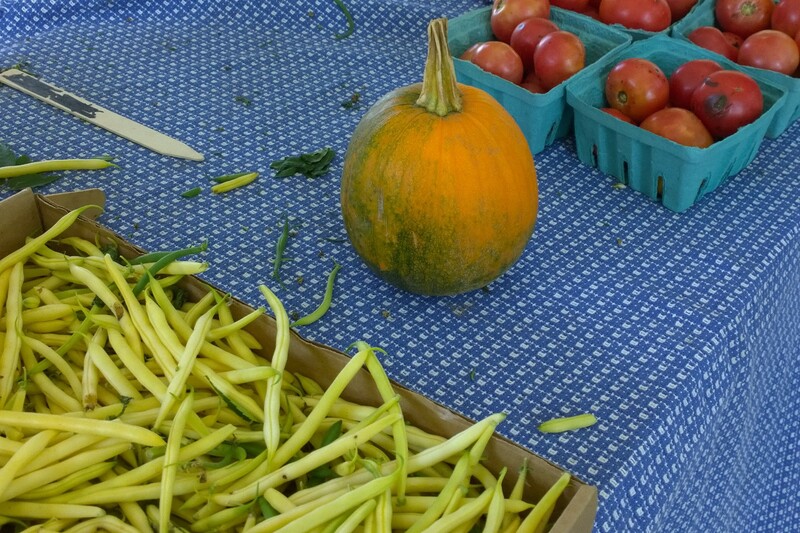 Who can resist a farmers market at this time of year? They are such joyful places. After his grilled cheese and his Del’s lemonade, our 3-year-old grandson chose the little green and orange pumpkin below. It’s now on his dining-room table at home. His sister, when she wasn’t sleeping, worked hard at inspecting everything on the ground and trying to put it in her mouth. A few words from the website on extra offerings that might interest backers of other farmers markets: “For your convenience, here are some of the unique features of the Hope Street Farmers Market: The Bicycle Valet at the Saturday morning market, run by Recycle-A-Bike, a volunteer-based community organization that connects people with refurbished bikes, provides practical bike knowledge, and advocates bicycle use by safer, more confident cyclists. Anyone can drop off their bike while shopping and know that it will be safely watched and sometimes even tuned up, for a small fee, while they shop. http://www.recycleabike.org gives a full description and mission of the organization. 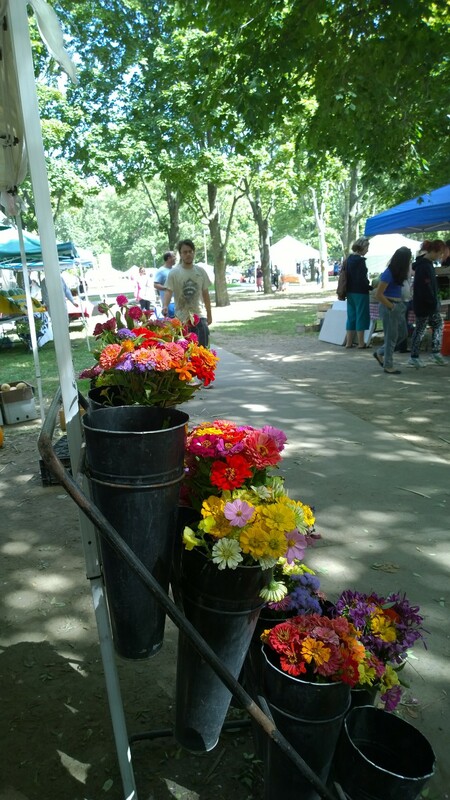 “Knife Sharpening while you shop is another new feature of our Saturday market. You can drop our your knives (wrap them carefully and mark them with your name please!) to be professionally sharpened for a small fee while you shop. 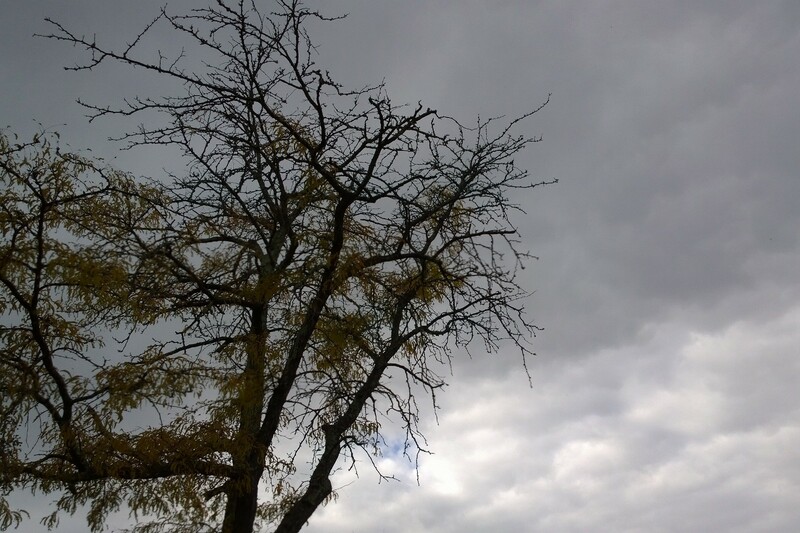 In my part of New England, Daylight Savings is drawing to a close with cold, wet, dark presentiments of the season to come. Seems like a good time to think about the fun we had in October. 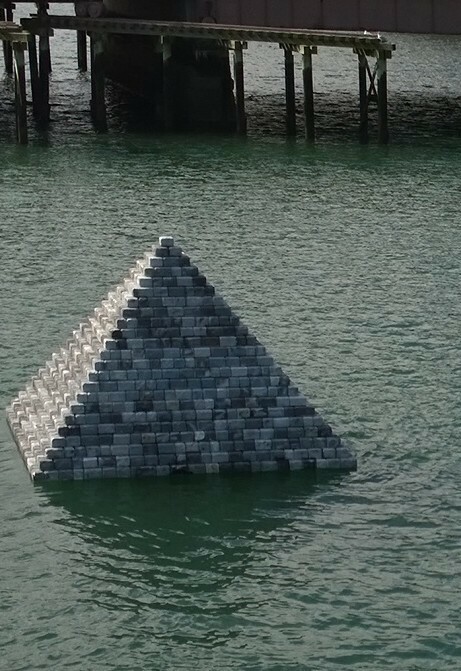 Artist Don Eyles floated a pyramid in Fort Point Channel until a storm blew up. 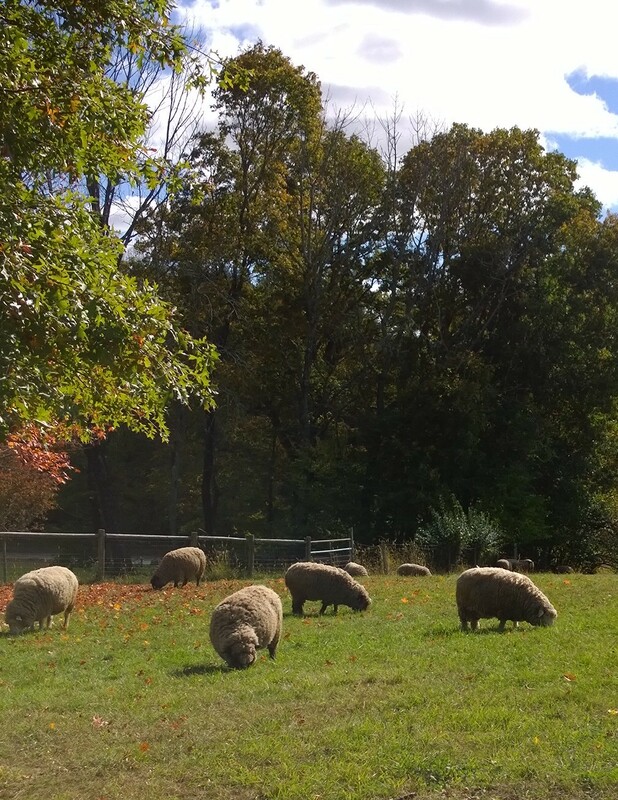 Suzanne, my husband, and our middle grandchild visited the sheep and other animals at the Audubon Society’s Drumlin Farm. 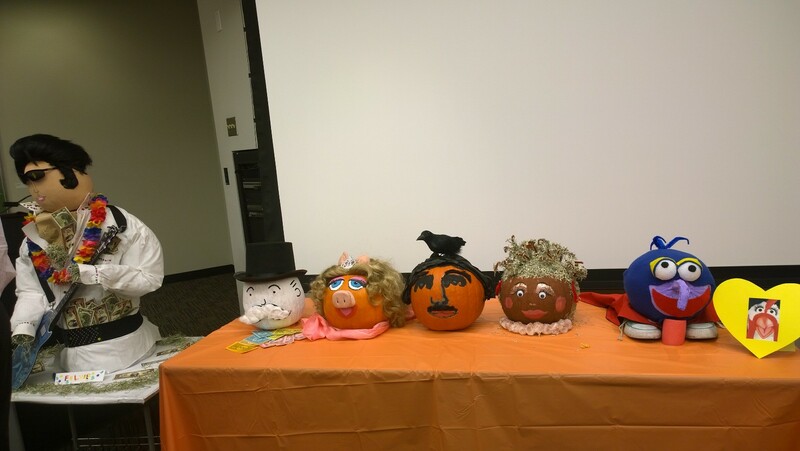 At work, we had a pumpkin-decorating contest. My team did Miss Piggy, porcine Muppet diva, to use the Wall Street Journal identifier. (Left to right, Elvis, the Monopoly Man, Miss Piggy, Edgar Allan Poe, Chia Pet, and Gonzo.) 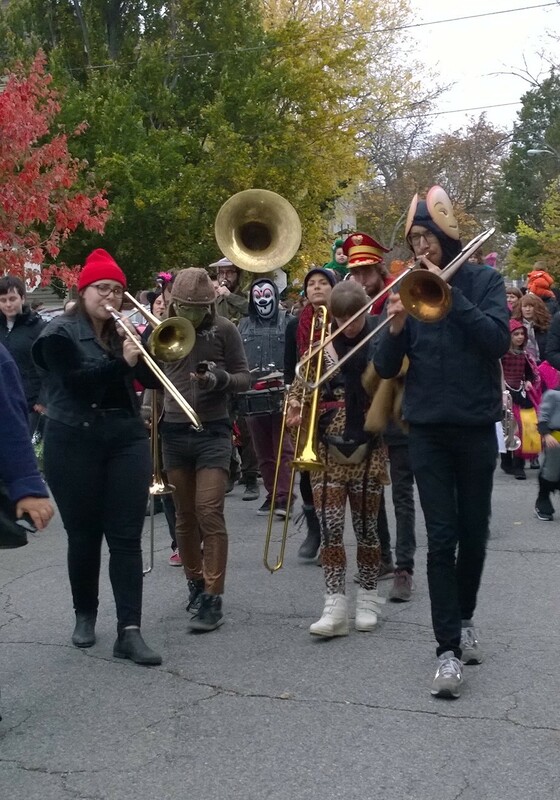 A Halloween band marched surrounded by babies, kids, and adults in costume all around blocked-off Providence thoroughfares near the Brown Street Park. 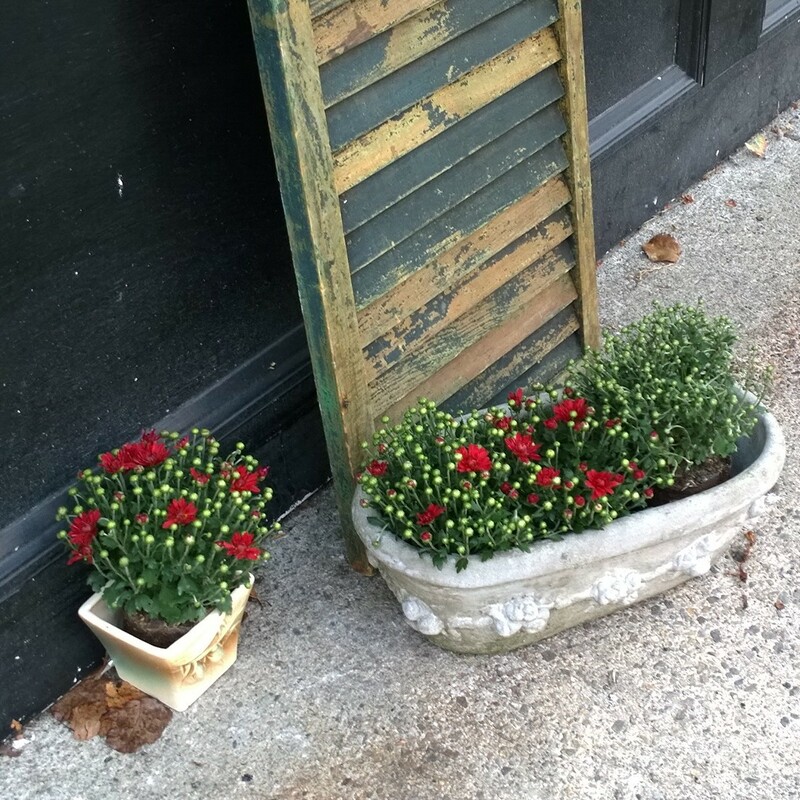 More quietly, chrysanthemums soaked up sunshine. Here is a bit of background on the pyramid, in case you are interested. More on the Pyramid and other Fort Point projects at tumblr, here. 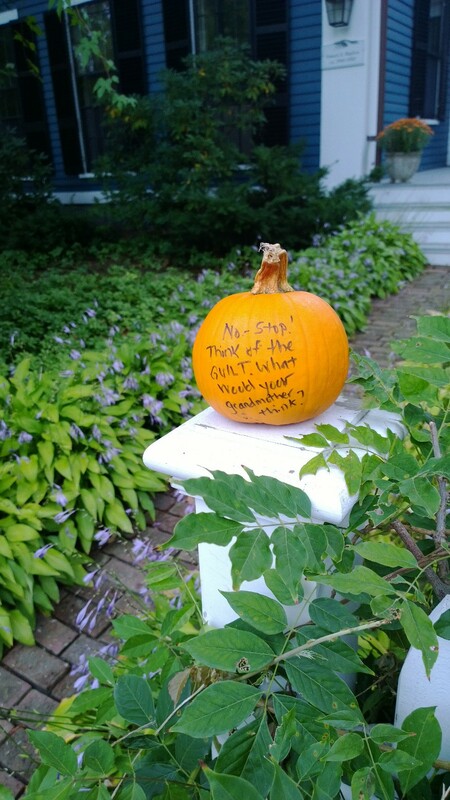 About a week ago, I noticed that a homeowner in town had placed sweet little pumpkins on her fence posts, about 20 pumpkins in all. 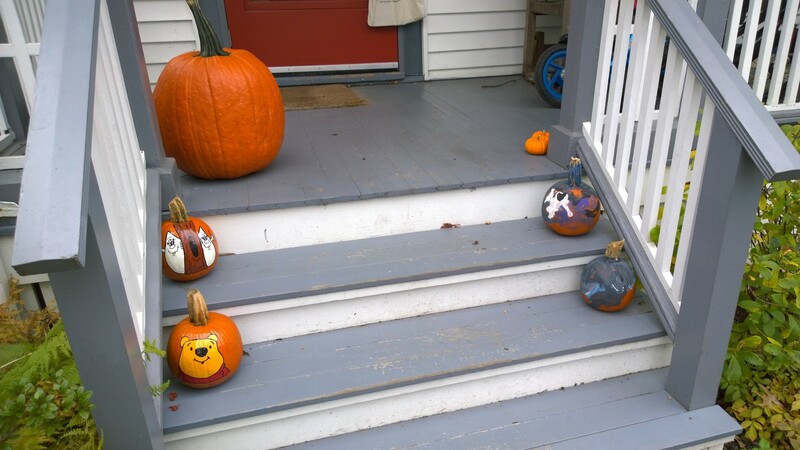 Something must have gone wrong soon after, because today her pumpkins all have anti-theft messages on them. Cute, if somewhat contrary to the original festive spirit. Will the messages shame the target audience? It reminds me of volunteering in seventh grade to paint approved pictures on shop windows at Halloween. The idea was to co-opt the kids who soaped windows on Mischief Night. Alas, I don’t think any of them volunteered to do the approved paintings. Lisa W. Foderaro writes in today‘s NY Times (here) about several elaborate carved-pumpkin events in and around New York City. Her article caught my eye because yesterday Suzanne and Erik took their baby dragon and Erik’s mother, sister, niece, nephews (in costume), yours truly and my husband to something pretty dramatic along those lines. In Providence. “Two carvers, Ray Villafane and Andy Bergholtz, who developed a national following on the Food Network’s ‘Halloween Wars’ show, were at the [New York Botanical] Garden in mid-October, using six-inch rinds of Atlantic Giant pumpkins to sculpture the zombie, whose organs and intestines poke through his cracked ribs. Their assistants were busy harvesting chunks of pumpkin with handsaws and, for the zombie’s jeans, steaming pumpkin rinds. “Mr. Villafane, a commercial sculptor who has made a year-round business out of carving pumpkins, said … his one disappointment this year was that the official ‘all-time biggest pumpkin,’ the first to weigh more than a ton, did not make it to the Bronx, as was planned. 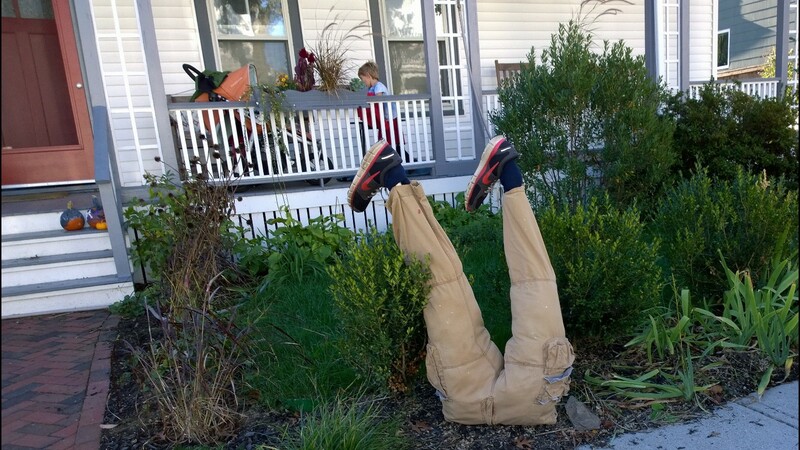 The 2,009-pound specimen, grown by Ron Wallace in Coventry, R.I., ran into trouble. Well, excu-use me! 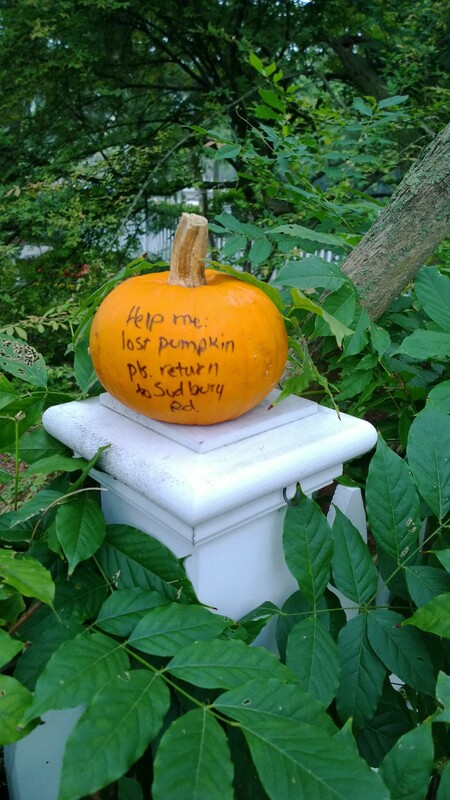 A Rhode Island monster pumpkin should have gone to the Roger Williams Zoo’s Spectacular, which was way better than anything the Times described. I’m afraid that Mr. Villafone tempted fate. Clearly a curse struck that giant pumpkin when it crossed the border. 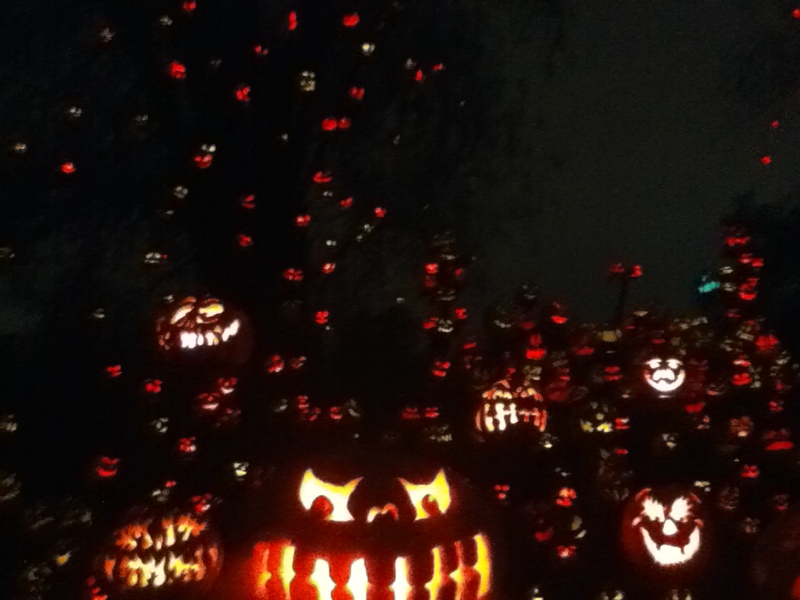 The Roger Williams Zoo Spectacular lasts the whole month of October, involves 25 carvers carving 25,000 pumpkins (replaced as they decay), and many fun themes (with piped-in music). We wandered from “Star Wars” to Beatles to “Gone with the Wind” to “The Wizard of Oz” and on and on. I was as amazed as the relatives visiting from Sweden. 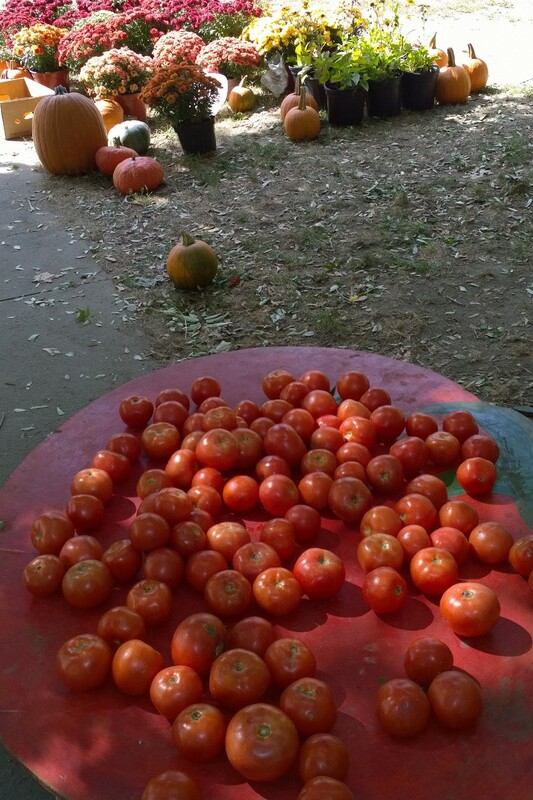 The idea of 25 people carving pumpkins for a month is in itself amazing to ponder. 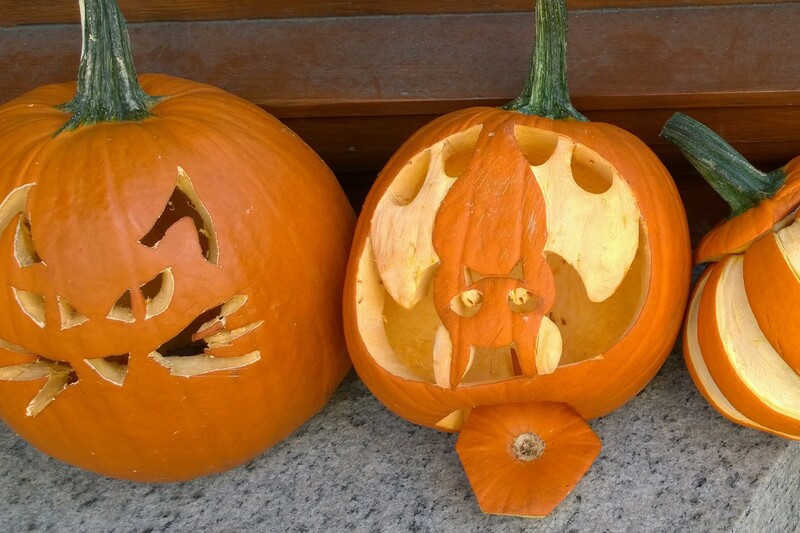 How much do pumpkin carvers get paid? What work do they have during the other 11 months? Are any from Rhode Island School of Design? The Spectacular would have been a bit scary for the youngest among us, I think, but he was jet-lagged and zonked out in the stroller. A buffet before the walk around the lake was super and got us in early, in front of incredibly long lines. Read more about it all here.